Have you ever thought of paying to obtain thousands of Facebook likes or twitter followers over night? There are companies who offer these services really cheap. Do you think when you pay some one to get these fans or followers who have no interest in your products or services can do any good to increase your bottom line? When you bought fans or followers, will they have any sincerity or attachment to your brand? I seriously doubt it. 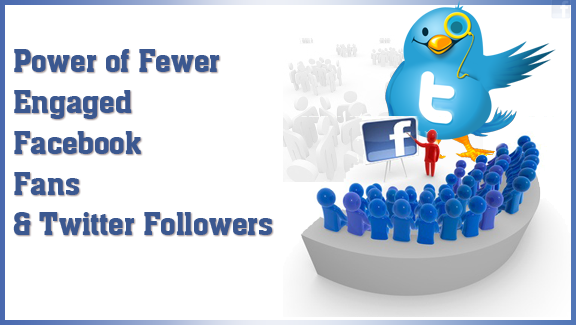 Therefore, it is really un likely to get the desired results from the paid followers. Actually Facebook degraded those pages which have thousands of Fans and no engagement. If you do not have engaged fans, Facebook gives you low edge rank, which means most of your status updates will not appear in the news feed of your fans and your all the hard work of creating and sharing content can we wasted. According to Facebook average user has 130 friends. Lets assume you have 100 loyal fans, who are really interested to listen what you have to say and will definitely share your content. This means potentially your content can be seen by 100 x 130 = 13000 only by having real loyal fans. We saw so much marketing thrown at us on a daily basis, we hardly notice any, such as TV adverts, news paper adds etc. But it is our human nature that when one of our friend recommend some thing, we definitely notice that. Feel free to add your thoughts in the comments below and let me know which one do you prefer fewer loyal fans or buying thousands of fans with no engagement.